At Metro Industrial & Marine Supply, we are proud to serve so many different industries in the Greater Fall River and New Bedford area. When most people think about industries that use hydraulics, they think about large tractor trailers, heavy-duty construction equipment, and farm equipment. However, there are lots of other industries who utilize our industrial supply and services for hydraulic hose assemblies in Fall River and the surrounding area. From building custom hydraulic hoses at our New Bedford shop to delivering top quality Fall River industry supply to our customers throughout the Southcoast region, we get to work with a wide variety of clients across multiple industries. We have a lot of farmland throughout New England and get quite a few folks from the agricultural industry in to purchase custom hydraulic hose assemblies. We offer a wide range of industrial supply and services to meet the needs of all our customers. Hydraulic sealed machinery helps farmers to increase crop yields, and is used in other types of farm equipment to perform all sorts of tasks, including threshing, baling, draining, and harvesting. Having the proper hydraulic hose assemblies in Fall River and the surrounding area is extremely beneficial to the agricultural industry in Rhode Island and Southeastern Massachusetts. Throughout the automotive industry, hydraulic equipment is used to provide better service and assembly. From American auto plants to local repair shops, hydraulic equipment is used to provide services not available with other types of equipment. Our Fall River industry supply is proud to work with so many customers that are in the automotive industry. Regular replacement of hydraulic hose assemblies in Fall River and the surrounding area can prevent dangerous leaks and failures from occurring and decrease downtime due to emergency repairs. Many different types of food production rely heavily on hydraulics. Manufacturing and packaging machines use hydraulic hose assemblies in Fall River, along with other industrial supply and services. Hydraulics and pneumatic seals help workers in production for a variety of different machines to keep them working safely and accurately on a daily basis. There are a lot of unique food processing plants in the New England area that rely heavily on hydraulic systems for the services that they provide. You might not think that concrete or masonry would be included with industries that use hydraulics, but they do. The continuous movement of concrete inside of a cement mixer truck or portable system is required to prevent concrete from solidifying. Concrete materials are extremely heavy and abrasive, requiring specialized hydraulics to prevent blockages from occurring within a concrete pump system. Hydraulic rams are also used to provide the means to operate the concrete pumping plungers on the boom for safe operation. Many different concrete and masonry businesses in the local area rely on Metro Industrial Supply & Services for hydraulic hose assemblies in Fall River and other essential components. Of all the industries that use hydraulics, the construction industry is perhaps the most well-known and appreciated. The use of a wide range of construction equipment relies heavily on hydraulic hose assemblies and other Fall River industry supply. 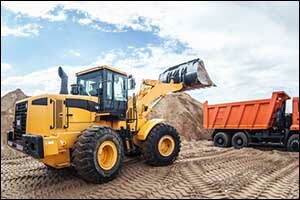 From excavators to bulldozers, backhoe loaders to over-size earth-movers, the operators of this heavy equipment rely on hydraulics to carry out their day-to-day operations effectively and efficiently. You can see them at work throughout the Southcoast area and all over New England. It is important to perform regular inspections and preventive maintenance of all hydraulic equipment to prevent a failure. If a failure does occur, the equipment must be shut down immediately, and all employees need to leave the area until the pressure has been fully released. This will help to prevent serious injuries, which can lead to illness, loss of limb, or even death. Pressure can sometimes remain within a system or hose even when the equipment is not operating. It can take somewhere between several minutes or many hours for all of the pressure to be relieved so that the assembly can be examined safely for repairs or replacement, as needed. Custom services are also available for customers who work in industries that use hydraulics. Our Greater Fall River industry supply can provide a wide range of industrial supply and services to meet all of your needs and specifications. Custom hydraulic hose assemblies in Fall River and the surrounding area provide many advantages to industry, creating a safer work environment and reducing downtime due to failure across the board. For more information about our custom hydraulic hoses and assemblies, give us a call at 508-996-8400 or visit our New Bedford location for custom hoses while you wait.